Raging Bull Racing was formed in 2010 by local athletes Sandy Cohen, Todd Johnson and Luke Wilson. 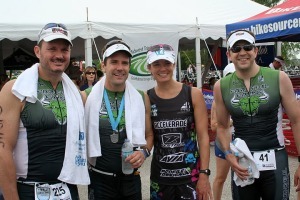 Sandy, Todd and Luke are accomplished cyclists and triathletes with numerous overall and age group triathlon wins in local regional and national races, including top 10 finishes and USAT Nationals and qualification for the Ironman 70.3 World Championship. While Sandy, Todd and Luke enjoy training and racing, they also value the friendships they made through sport. Raging Bull Racing was formed for the dual purpose of creating a competitive racing team and building camaraderie amongst local racers and competitors. 2011 is Raging Bull Racing’s second year of racing under the team name, though most of the team’s members have been involved in the sports of triathlon and cycling for over 10 years.